It all began in Edinburgh (what is the right way to pronounce it? I will never know) in summer 2017. We were spending a couple of days in the city before a training course on storytelling. 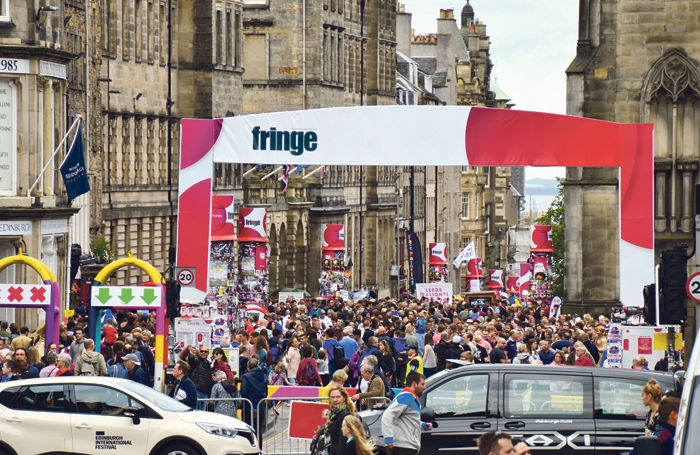 The Fringe Festival was rolling, and we catched as many shows as we could. I must admit that before that, I loved stand-up through videos or TV, but I had never been to a live show. Watching it there live on stage and in its natural setting made it so much more “real” and relatable to me. Also, while some of the performers were clearly top notch, others were… a lot more within reach, let’s say. I already had 10+ years of professional experience as a speaker and trainer, and usually people would say that I was “funny”, but that was the time when I thought “wow, I could really be doing this”. The adrenaline, the thrill, the electric interaction with a live audience, the feeling of not knowing what could happen next… it really had a fascination on me. I was under a spell. During the Fringe festival (every August), Edinburgh hosts hundred of events. Something had begun. I started observing things from news and my everyday life in a different way, writing down notes, working on “the material”. Back to Prague, I looked for places where I could give it a try. 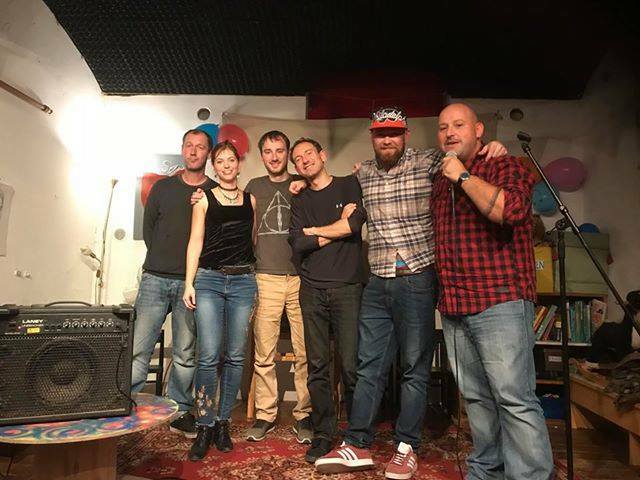 It wasn’t long before I found out about Velvet Comedy, one of the most established stand-up shows in English in Prague. They did open mic nights every Tuesday. Once, I went with my wife Bara and my good friend Robert. Kristyna, the local host, opens each show reminding that “it’s the friendliest show in Prague” (not always true, as I found out, but the intention counts). The comedians before me were good but not impossible to match, or so I thought (this has been a factor: had I realized that the bar was too high for me, I would probably be intimidated and changed my mind). There was still an open spot, it was announced. I hesitated, I took my courage, went backstage and asked for five minutes. She said OK. And so I opened the second half of the show with casual, silly jokes about my first name, where I come from, living in Prague… and the reaction wasn’t bad at all! This set things in motion for what has become an important part of my identity, and life. So, so much more than a hobby. 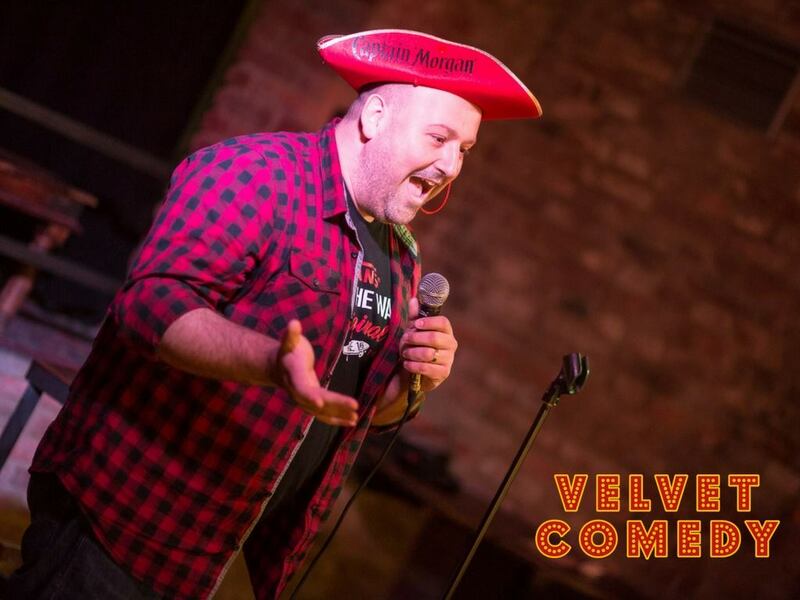 This was Halloween Special 2017 at Velvet Comedy. I can’t wear hats, my head is too big. Good for comedy, though. So here is the first lesson: if you feel that “maybe, you could do this”, do it! You will never know what you miss, and if you are good at something, unless you give it a real try. I know it sounds banal, after all it’s the story of literally every inspirational book or film. But that’s because it is so true. Yes, connections, talent, education and luck can give you a better starting position, but at the end of the day what makes the difference between who makes it and who doesn’t is this: give it a go. Seriously. And now, let’s see the mega list of the 7 important lessons I learned in the past few months doing stand-up. But before we start, why don’t you like my comedian page? It would be so important to me! The cool “blue background with letters” in Bar Coming Soon in Prague. 1. Making Mistakes is the only way to get better. Again, obvious, right? Except, apparently it isn’t! A big part of our culture revolves around avoiding and stigmatizing mistakes. Mistakes can make you fail at school – many tests encourage not giving an answer, rather than trying and giving a wrong one. No surprise we are not raising generations of risk takers. In stand-up, instead, there is only one teacher, and that is direct experience. My judgement about what is “funny” and what not is right about 50% of times. Sometimes I get on stage, deliver my punch line and… crickets. Nothing. Stone cold faces. Sometimes I try a half-baked joke, and I get an unexpected laughter as a reward – sign that I struck a vein, somehow. Comedy rewards risk taking, going out there, being on the edge, trying what hasn’t been tried, saying what hasn’t been said. This process needs to be fueled by mistakes. And the audience knows it: they will forgive you if some of your jokes fall flat, as long as you keep trying. Being a comedian helped me to deal with mistakes, in general. “Hey, I needed to try”. “Sorry, I thought it was a lot funnier. My mom told me”. “Thank you, one person there in the corner, for laughing”. Sentences like these become part of any comic’s repertoire, but they also help in other areas of life. Fantastic group picture after a performance, half training half comedy with Deina in Trento, Italy 2018. 2. The audience is your best friend. So many aspiring creatives are terrorized by the audience’s reaction to their work. “What if they think I am an idiot?”. Well, rest assured, they certainly will. Some of them. But others won’t. And if you have a story to tell, or jokes to make people laugh, it is your obligation to go out and find your audience. People love entertaining stories. Everybody loves to laugh. There is a huge need out there for brave entertainers, and the darker the times, the bigger the need. Go out with an attitude towards the audience that says “I have something here, and I know you will love it” – and people will respond. In storytelling and entertainment, there is a great deal we are willing to overlook, if we get a good experience in return. Your audience will forgive your mistakes and imperfections, as long as you are honest, work hard, are creative and do your bit. This applies to every creative or performing discipline. We admire courage and (though sometimes we are jealous of it) this will inevitably attract praise. This doesn’t mean we can be sloppy or unorganized, however. You will still need something to say, and work hard to hone your skills (see point 3). But if you fail, the audience will always grant you a second chance. 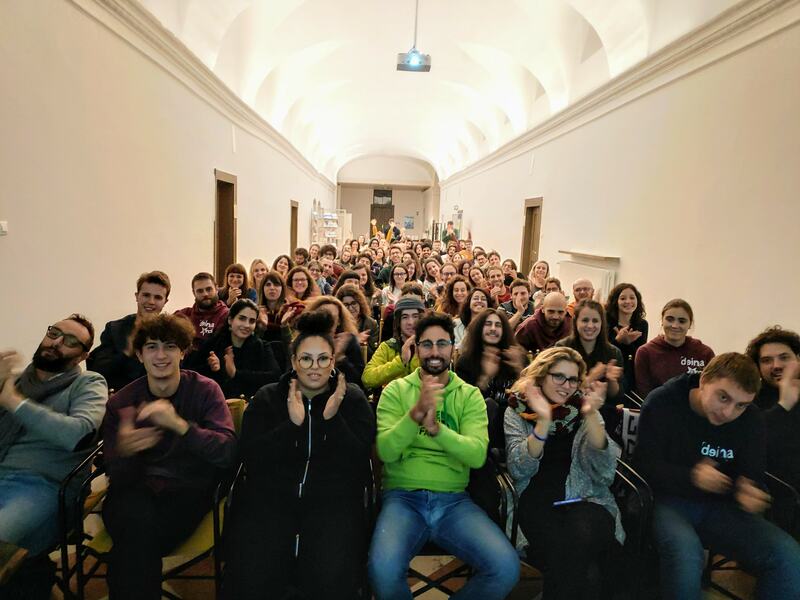 Stand-up comedy workshop in “Stagecraft”, Sermugnano, Italy 2018. 3. It’s all about the practice, practice, practice. This is the “hard work” I mentioned above. Sometimes I watch established comedians and think “God, I will never be as good as them”. Ok, maybe I won’t – but at the same time, the guys have 10, 15 years of experience more than me. I should give myself a fair chance! I know I am somewhat of a late starter. 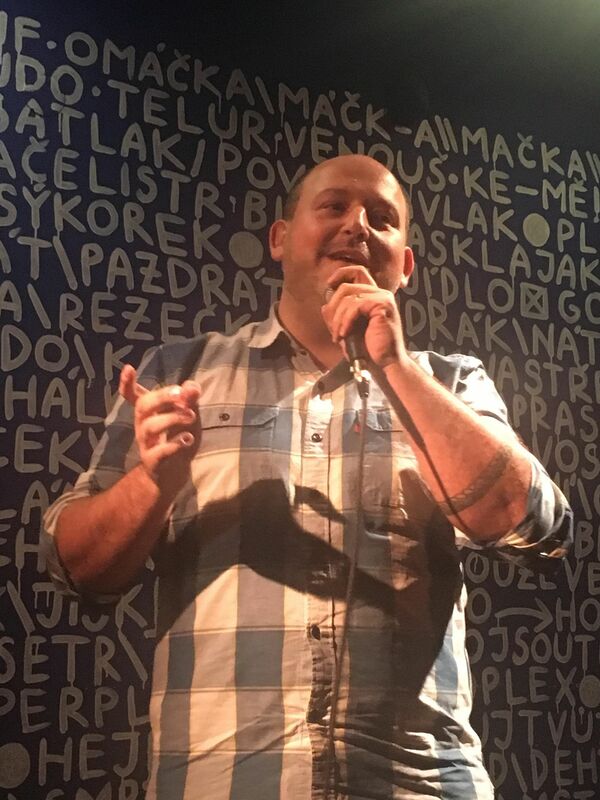 People start in their 20ies, and I know some amazing comedians in Prague who are doing just that. So maybe I will never be a top class professional, but while I am doing it, why not aim to the top? I take every opportunity I can, to get stage time and practice. Two, three times a week. Open mic nights in semi-deserted cellars? Done. Saturday morning workshops with 3 other comedians? Done. Winter time shows with just a few backpackers in the club? Done. I workshop with established comedians, anytime I can. I do impromptu “specials” up to 45 or 60 minutes, at the end of my EVS or Erasmus+ trainings (great practice for working with diverse crowds). I took improv classes, even training in singing and musical. Even dancing! Everything helps. 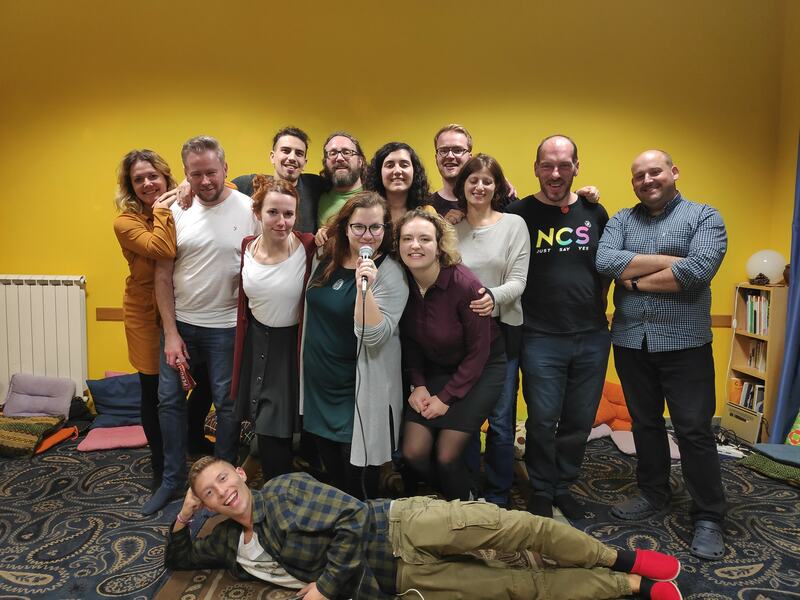 I joined the best (and so far, only) stand-up comedy training course in Prague, with my friend and mentor Luke Ryan, founder of Comedy Prague. Weeks of practice, writing, delivery and valuable feedback – all you need to jump start as a comedian. And this was only the beginning. Now I am always working on the material. Swapping two words, a different choice of adjective, a pause, an intonation, the emphasis on non verbal cues: all this can change so much the way a joke works on stage! It’s a craft: a constant process of developing new material, and honing the existing one into a better form. A never ending personal development that helped me a lot in life and work. As a comedian, I am so different from the guy who was being awkward on stage in 2017 (and thanks God). As the great Joan Rivers tells Louie (S02E04) “Things don’t get better. We do”. 4. Get close and personal. Every comedian has to “find their voice”. But what ever can set you apart from every other funny guy out there? Your unique self. This is a hard lesson to learn, because it means to be exposed and reach for authenticity and vulnerability. Yet, it works. Even during the course of a short five or seven minutes set: if I manage to make a little bit of myself be seen through the haze of words and jokes, people will connect. Some of my best sets come from personal life stories that otherwise would be painful or “too personal” to tell. Hospital visits, an assault I witnessed, racism, pineapple pizza and mafia-inspired barber shops and restaurants: comedy can literally turn lead into gold! Also, it builds community. Humor can be an incredible tool to bring people together and make us feel we are not alone, but in order to achieve that, our voice has to be relatable. There must be something that resonates with others, and what is it that really connects us? Our deepest fears, the weak spots. That is what makes us humans. Regardless of culture, gender, age. I have seen comedians from the other part of the world have an entire club eat from the palm of their hand. That can happen when they strike a personal chord, allowing others to connect. And mind you, this doesn’t mean to be cocky and arrogant. Actually the opposite. Great comedians are able to humble themselves, at the same time exposing the biggest paradoxes of life. That is the most powerful connection, and it can indeed be a healing experience. Final photo for a night as MC in A Maze in Tchaiovna, Prague. 5. The fine balance between “it’s my message!” and giving people what they want. When I was starting, it was easy to get big headed and think “ok, I have the microphone and a room full of people, time to tell them what I think!”. It took me some time to realize that it’s a little more complicated than that. The famous comedians go out there to speak their unique message, and people pay to hear it. But at the ground zero level, in the primordial soup of the clubs where stand-up comedy is created, people meet to have a good time, maybe at the end of a working week. They need to release, they need to laugh. When I bring an uncomfortable topic on stage, the audience reaction can vary a lot. People will enjoy it only if they are already aligned with my worldview. Or if they are in the mood to be challenged. But I risk to alienate everybody else. Is it worth it? Do I even have the right to do it to other people? At the end, I lean towards a balance. First, I want people to have a good time and let go a bit of pressure. We are here all together, let’s have some fun. And then maybe, I drop some bits of thought provoking stuff. I can’t help it, I am very political, and after all I want to be authentic. But I am not there to preach, and the stage is not my personal soapbox. Some people will like me more for that, and some people less, but I want to use comedy to bring people together, not to create divisions. 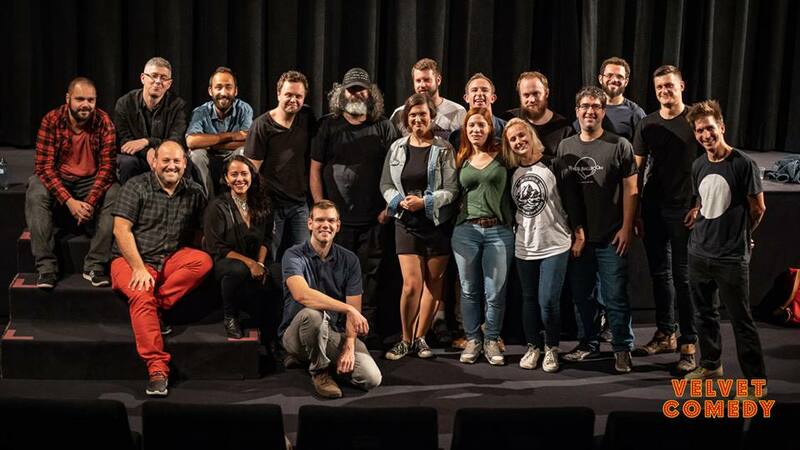 Many of Prague’s finest comedians in a group photo with Judah Friedlander. 6. Taboo topics and how to treat them. Are there “forbidden” topics? This is something every comic needs to decide for themselves. There is a heated debate right now about the boundaries of comedy as an art form, and whether or not it’s even “allowed” to joke about some sensitive issues. I personally don’t think there should be taboos. If we don’t speak about something that offends us, it doesn’t just stop existing. On the contrary, it keeps growing in the dark. Until it maybe gets out of control and we go like, “how did we get to this point?”. Comedy can be an extraordinary tool to speak the unspeakable, and even explore some darker corners of our collective minds. Maybe just to see what’s the effect, or if something hurts, ask ourselves where is the pain coming from. Different audiences will react in very different ways to that. I find American young people especially sensitive to “hot” topics. In Europe (and especially in central Europe), dark humor is well received, even welcome. It’s history, it’s culture. It’s easy to find articles on both sides of the fence and everybody is invited to have a point of view on the matter. I do have a very dark sense of humor (I have been told) and that’s what I can bring to the table. I don’t normally see the glass half full; if it is, it’s gone sour. But I try to do it with levity, remembering that comedy should be “punching up” (at the power and privilege) rather than “down” (the victims of oppression). Of course there are many thin lines here, and everybody has different views on what is “up” and “down”. Is a “sexist joke” making fun of the victims, or is it an opportunity to reflect on sexism in society, and how disgusting it is? It all depends on the joke, I guess, and the way it is delivered. Not easy to handle. But that’s why it’s an art and a craft. My cover picture from the legendary (and now gone) Red Room Comedy Hour (2017-2018). 7. People take comedians way too seriously now. As the relevance of stand-up (and comedy in general) grows, so does the attention from critics. This is made more complicated by the fact that some comedians have achieved superstar status, move a lot of money and have great visibility in the media. So what they do in their private life, or what they say, is subject to a lot of scrutiny. I am going to walk on some thin ice here. When Louis CK made a comeback after his sexual misconduct scandal, the performance triggered very detailed opinion pieces on basically every media outlet, including the Guardian or the New York Times. Regardless of our personal view on the matter, my question: is it even appropriate, to dissect a comedian performance live – and in a private club – as if it were a State of the Union address? Jokes are jokes, and while there is a “political” meaning in every form of art, I don’t think it’s healthy to take this to the extreme. We are so used to what horrible world leaders say – and most importantly, DO – that they manage to get away with a lot of rubbish; while a certain political correctness is shutting down spaces of expression for that one form of art that is supposed to be anarchist and irreverent by definition. This doesn’t feel balanced and in my opinion, is not healthy. A joke has offended you? You will survive. And if it hurts, don’t get mad at the joke. Maybe reflect on why it hurts. Politics and art go hand in hand, but the boundaries should remain clear. When a comedian becomes a political leader, as it happened in Italy, things inevitably get hairy. Because comedy can do many things – it can be a scalpel or a sledgehammer – but it lacks the balance and attitude to compromise that politics must have. Comedy is here to say something; politics must listen first. Comedy looks for shortcuts, if it’s not directly causing short circuits. Politics must sometimes be boring and look at facts, even if it takes time. Let’s be careful and leave things where they belong. Free spirited comedy and savage jokes in the cellar; and open minded, compassionate politics in the houses of the Law. I hope you enjoyed this post! Please be kind in the comments. As always, don’t forget to follow our facebook page, (now with more than 1,000 likes!) and if you are in Prague, come and join one of our shows at Comedy Prague or Velvet Comedy! 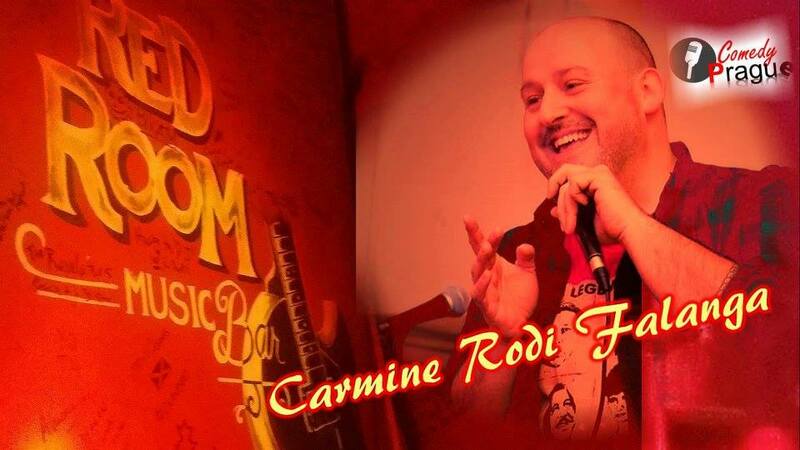 (the cover picture was taken by the staff of the Comedy Special in Tbilisi, Georgia, in April 2018).